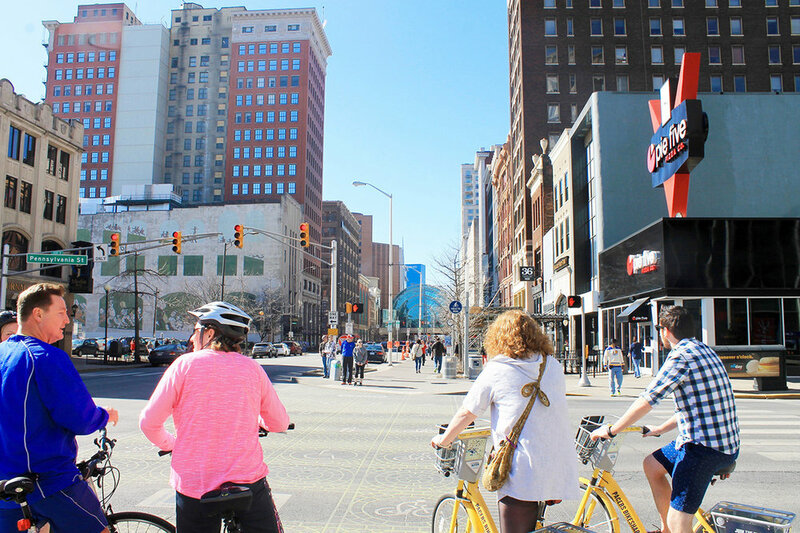 Is Indy Losing its Bicycling Mojo? The United States Census Bureau released 2016 Journey to Work data this past week, and it does not paint a pretty picture for bicycling in Indianapolis. In fact, many cities that are notoriously bike-friendly, lost some ridership. This includes Portland, OR and Minneapolis, MN. However, this isn’t necessarily true across the board. The average change for bike commuting throughout the United States is a decline of 0.4%, likely attributed to low oil prices and the increase in vehicle miles traveled (VMT), resulting in a spike of road deaths. *It’s important to note that these are commute trip counts only and not counts for all trips. Commute trips account for less than 20% of trips, on average. Indianapolis posted a steep drop; 12%. While Indy has seen bicycle commuting increase by 222% since 1990, this drop is the first recorded in recent memory. Some cities, however, posted record highs. These cities include Pittsburgh, Cleveland, DC, and Detroit. So what are these cities doing that the bike-friendly cities, and Indianapolis, aren’t? They’re building protected infrastructure, and lots of it. These cities have adopted bicycling-heavy transportation policies and plans, and they’re allocating the funding to implement greenways and protected bike lanes to show that they are serious. It can be argued that Indianapolis has become complacent in our bike lane building. We adopted one of the nation’s first Complete Streets ordinances and built the infamous Cultural Trail. After that, things have somewhat coasted. Butler University recently completed a small, yet disconnected, segment of protected bike lanes, and the protected bike lanes under construction along East Michigan and East New York abruptly end at Rural on New York and at State on Michigan. Greenways have expanded, but in small segments within the compact zone. Large extensions (e.g. the Eagle Creek Greenway) have been built for recreational purposes in the metropolitan zone. The Pennsylvania Street protected bike lane has been less than stellar as Strong Indy has written about. It’s too short, provides no opposite direction of travel, provides few connections to other bike infrastructure, and protection is minimal and removed for half of the year. The West New York cycleway stops one block short of where it should, making access for bicyclists coming off of the White River Greenway or coming over the White River bridge going east incredibly challenging. We’ve picked all of the low-hanging fruit and it’s time to climb the tree for some harder to reach apples. How can Indianapolis start getting its bicycling commute share to climb again? IndyRezone, which includes provisions for the reduction of car parking spaces if more bike racks are added, was a great start. However, bike parking is useless if there is no means to safely use bicycles. The historical choices made by city and county (and then city-county) administrations of past makes Indianapolis especially challenging when it comes to accessibility for those on foot or bike. Cheap sprawl was encouraged, wide roads with no sidewalks or bike lanes were built, and city-owned parking was privatized for desperate one-time revenues. Maintenance of existing facilities has been deferred for decades, making even some local streets barely passable, and policy within the some of the city’s departments continues to prioritize the movement of motor vehicles with minimal delay. There’s a lot of work to be done still. In the following paragraphs, I have outlined some ideas and actionable items to be taken that can improve bicycling safety and lead us towards enhancing bicycle commuting once again. Most of Indianapolis’s bike lanes are simple lines of paint, much of which is in the door zone. It is recommended that the City of Indianapolis and its various departments adopt a minimum standard of design that prioritizes protection of bicyclists from vehicular traffic and keeps them out of the door zone where there is parking. It is recommended that these design standards be derived and adopted using the National Association of Transportation Officials (NACTO) Urban Street Design Guide. Any adopted standard should make bicycling as transportation a safe and comfortable experience for anyone of all ages and abilities. This standard should go beyond primary arterials and collector streets to also examine opportunities for “neighborhood greenways/bike boulevards” on side streets, which provide bike-friendly features like micro-roundabouts, lane markings, and wayfinding. The Mile Square is where the greatest concentration of bike trips currently occur. It has been noticeable by many who bike the Pennsylvania Street bike lanes that motorists cut across the bike lanes as the light turns green, running the risk of right-hooking bike and pedestrians. Part of this is a design problem, not enough of a sightline has been established to allow drivers to see the bikes to the right of them. The stop bar should be pushed back while allowing bicyclists to be moved to the front, putting them within the line-of-sight. Additionally, the City and DPW should establish leading intervals at intersections. These intervals give an extra 3-5 seconds of green time for bicyclists and pedestrians before the light turns green for motorists. This allows bike/ped users to clear the intersection more quickly and puts them in the line-of-sight for motorists. Prohibiting right-on-red within the Mile Square to reduce motorist/pedestrian collisions as part of the WalkWays plan has been proposed for some time, but this could also have benefits to bicyclists. It is unknown what the status is of the no-right-on-red proposal. Maybe it’s time to help push for this again. Level of Service is frequently used by transportation departments as a means of performance measurement. This method measures seconds of delay at intersections and along routes for motorists. However, LOS focuses almost entirely on motorists with little consideration for other methods of travel. This makes implementing protected cycling and walking facilities difficult, as it often requires the reallocation of existing travel lanes and the reconfiguration of intersections. One such new option for performance measurement is vehicle miles traveled. VMT can be used to measure total or per capita VMT, calculate air pollution, GHGs, and energy impacts. The goal of VMT performance measurement is to reduce VMT, rather than decrease travel time through increasing vehicular speed. This shifts the practice from expanding roads and intersections to prioritizing methods of travel other than motor vehicles. Additionally, it encourages infill because it has a reduced VMT per capita. Under LOS, sprawl is encouraged because greenfield developments essentially have no congestion impacts within the immediate area. While this link is a California-based viewpoint of LOS, it provides an excellent summary of the overall goals and benefits of the VMT performance measure. The City and its various departments that serve bicycle transportation-related purposes (e.g. IndyParks, Department of Public Works, and the Department of Metropolitan Development – Transportation Division) as well as non-profits working on bicycling access (e.g. IndyCog and Central Indiana Community Foundation) need to coordinate and prioritize investments based on need and location of disadvantaged populations. This needs to be a data-driven analysis examining the lack of protected bike facilities on major roads within the compact zone, locations of disadvantaged populations, traffic counts, and high-crash intersections. The ultimate goal should be to create a connected network of protected bikeways and greenways that provide vast accessibility to the city as a whole, but largely focused on accessibility within the compact zone (where usability of bicycles as transportation is greatest). There are several gaps in Indy’s bicycle lane network that need to be upgraded and closed. This includes the Pleasant Run Greenway at English and Washington, Prospect Street, Southeastern Ave, and the remainders of Michigan and New York (both east and west). This one is self-explanatory. The City-County has developed cycling facilities where it has been relatively cheap to do so, using paint when resurfacing existing streets as part of the Complete Streets ordinance. Budgets from the City-County now need to reflect that proper bike facilities will require planning, effort, and materials, and should prioritize the funding of a well-connected system of protected bike lanes and greenways within the compact zone. This is the cheapest and most effective way to move a lot of people through the city to places that people need to go. The design of protected bikeways need not be overly complex and it should also be pleasant. Planters within the Mile Square and neighborhood village centers are an option that is relatively affordable but provides a level of protection that is desired. Simple concrete curbs drilled into the pavement, such as what has been done in Edmonton, are a low-cost and simple way to quickly implement protected bike lanes on arterial streets. There are now businesses dedicated to providing pre-fabricated protected bike lanes, making the implementation process quick and inexpensive. I want to note that this write-up is not meant to be a criticism of DPW, DMD, or the City-County. We have come a very, very long way from our status in 2008, when we had virtually no bicycling facilities or infrastructure to speak ok. The powers that be have done a great job in working to get to where we are now. Indianapolis can get its mojo back when it comes to bicycling, but we have to be willing to make some politically difficult choices. The DMD will soon be developing an updated bicycle plan for the City of Indianapolis, and I encourage individuals to participate in the process and call for quality facilities. However, many of the needed changes need to come from higher up, with leadership required from the City-County Council. In a city like Indianapolis, we have the ability to work directly with our councilors and other leading individuals within our city-county government. It will take communication and coordination to make these changes happen, and recent numbers tell us that it is time to take action. To see the full report on 2016 bicycle commuting in the United States, check out the League of American Bicyclists.